NEW ORLEANS, Louisiana (AFP) – Using underwater robots, BP engineers worked on Sunday to replace a cap over a gushing oil well in the Gulf of Mexico as part of a new attempt to contain the worst environmental disaster in US history. The old cap loosely covering the well was removed by the robots on Saturday as the first step in the operation. A fleet of about 400 skimmers crowded around the well site to boost shoreline defense during the complex operation, BP said, as the oil giant struggled to put an end to the damaging spill. "Over the next four to seven days, depending on how things go, we should get that sealing cap on. That's our plan," BP senior vice president Kent Wells told reporters. "We've been 24/7 since the beginning and that will continue until the end," he said Saturday evening. The cap aims to provide a temporary solution to the devastating spill triggered after the BP-leased Deepwater-Horizon rig exploded and sank nearly three months ago. An estimated 35,000 to 60,000 barrels of oil (1.5 million to 2.5 million gallons) has been gushing out of the ruptured well each day, and the current containment system has captured around 25,000 barrels every 24 hours. BP says the new cap and the addition of the Helix Producer containment ship will raise capacity to 60,000 to 80,000 barrels (2.5 million to 3.4 million gallons) a day -- in effect halting the leak that has imperiled wildlife and livelihoods across the Gulf Coast. "This new sealing cap has not been deployed at these depths or under these conditions, and there can be no assurance that the sealing cap will be successfully installed or installed within the anticipated timeframe," BP warned in a statement. No permanent solution is expected until the first of two relief wells is completed in order to inject drilling fluids into the gushing well and then seal it for good with cement. 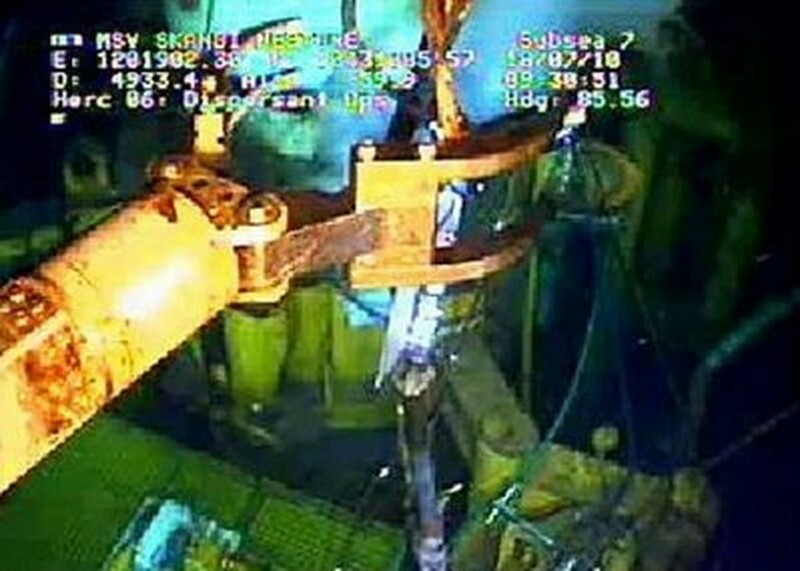 BP engineers were manipulating the undersea robots nearly a mile (1,600 meters) below the surface, rushing to take advantage of about a week of expected favorable weather conditions in the spill area. They were working to remove a bolted flange, a rib-like assembly that must be taken out in order to install another piece of equipment -- known as a flanged spool -- over the drill pipe and connect it to the new containment dome. On Saturday evening, Wells said a "torque tool" was being used to loosen the first of six bolts on the flange, and that BP hoped all six would be removed by Sunday. Once the top flange is removed, BP has to push together two sections of drill pipe in the well head, experts said. Then a flange transition spool will be lowered on top of the flange using a crane. After the spool is in place, the new cap can be positioned. Wells said the Helix Producer container ship was also undergoing final tests and should begin capturing some of the leaking oil from the well on Sunday. "We expect it to start ramping up collection tomorrow and it'll ramp up probably over a three-day period to get up to its full capacity," he said. A containment ship that was connected to the old cap, the Discovery Enterprise, has been removed from the site, but will return once the new cap is in place. A third ship, the Q4000, was expected to continue siphoning up some 8,000 barrels a day during the installation of the new containment device. BP has stressed that back-up options are available, including a new "top hat" containment system. "We always have backups for our backups," Wells said. Workers have boosted skimming activity to collect spilled oil and a dispersant "wand" has been placed inside the free-flowing riser pipe to allow the gushing crude to be broken up deep below the sea. The existing cap, installed over a month ago, allowed some oil to continue escaping because it was fitted loosely fitted over a jagged well pipe. Some 2.1 to 4.1 million barrels of oil have spilled into the Gulf waters and experts warn it will be years, if not decades, before it stops washing up on shore. Coast Guard Admiral Thad Allen said he had approved the latest plans Friday because they will provide for "far greater" containment capacity than current systems. Oil has now washed up on beaches in all five Gulf states -- Texas, Louisiana, Mississippi, Alabama and Florida -- forcing fishing grounds to be closed and threatening scores of coastal communities with financial ruin.